So, once Weedeater’s Dixie Dave blew off his toe while cleaning a shotgun, their upcoming tour and album were put on hold. But, apparently Dixie Dave is recovering, thusly inspiring a tour revisit and revision. It’s now being called the “Nine Toe” tour. Here's a quick update...Dixie is still resting his foot and only drinking half as much bourbon as usual so that he is healed in time for Weedeater's hobbled yet glorious return to the live arena. Below are the tour dates; we'll have ticket links for you soon so keep checking back for updates. We will be playing new material from our upcoming release Jason...The Dragon, to be recorded with Steve Albini at Electrical Audio in late April. Much thanks to master Steve for letting a bunch of crazy, dirty, toeless, gun-toting hillbillies back into his pristine studio so we can scuff-up the floor and bang a bunch of his pots & pans together so as to call it "music". That took some class (more than we have anyway) and in all seriousness we are truly appreciative for Steve and everyone else at EA being so cool about rescheduling this session. 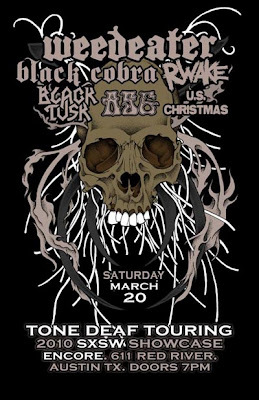 The support bands on this US tour are all incredible and include: Black Cobra, ASG, Black Tusk, The Gates of Slumber, US Christmas, and Struck by Lightning. During the Tone Deaf SXSW showcase in Austin, the mighty Rwake will also make a rare appearance joining the party for one absolutely insane night of music. We'll have more updates shortly on the summer tour / fests in Europe as well as the tentative release date for Jason..., so you'll be hearing back from us soon enough. See you out there, don't step on Dixie's foot, and of course, thanks to all of you for your continued support!